In theory, push-ups seem simple enough – lower your body to the ground, then push it back up. Easy! But we all know that’s far from the truth. Especially if you’re not naturally blessed with the strength to do strict-form push-ups, it can seem nearly impossible to do this move with perfect form. Thankfully, there are a few exercises you can do to get better at push-ups. What Muscles Do Push-Ups Work? It’s well worth your while to learn to master this move, even if it seems a little out of reach at first. That’s because the benefits of push-ups are numerous. Push-ups work many key muscles of the upper body, including the arms, pectorals (chest), deltoids (shoulders), triceps, and also the core. 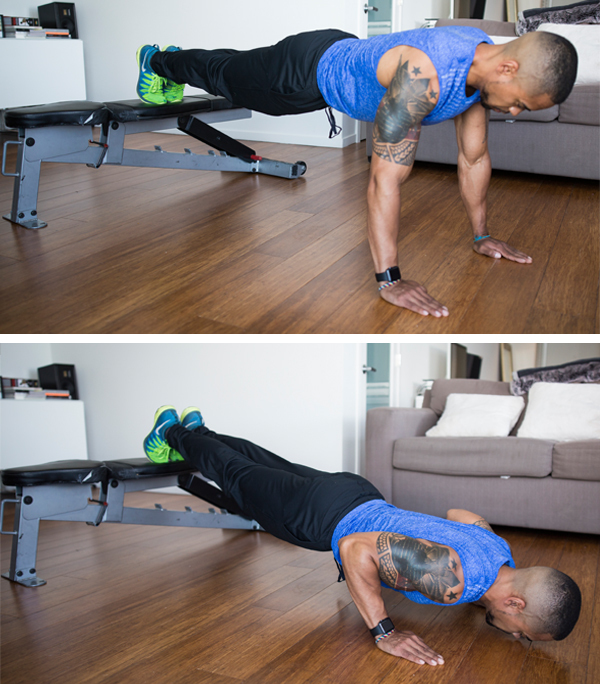 Because of this, the push-up is an evergreen fitness movement that’s done everywhere from the gym to the army barracks, and it’s not going away any time soon. If you’re struggling to even do a single push-up, all hope is not lost. With some time, effort, and a little creativity, you can push your way to success. Follow the guide below to kick your push-up strength up to the next level, whether you’re a beginner or you just want to improve and build more strength. Before you can get better at push-ups, you first have to know how to do a proper strict-form push-up (that’s just a normal push-up). • Your feet should be together and your hands should be slightly wider than shoulder width. • Throughout the movement, your head and hips should be in alignment with your spine, and your body should form a straight line from the crown of your head to your heels. Clench your glutes and brace your core to lock your body into position. • When you lower yourself down, keep your elbows tucked close to your body. They should form a 45-degree angle to your torso when viewed from above. • In the lowest position of the move, your chest should be about a few inches from the floor. • As you come up, your shoulders and torso shouldn’t twist, and the weight of your upper body should be evenly distributed between your two hands. Once you’ve perfected the proper push-up form, the next step is to figure out your push-up level. Drop down and knock out as many reps as you can using the proper form, then use your “max reps” score to determine your level. Can’t do any? No problem — start at level one which is the first section below. Managed to do a few? That’s great! You’ll find the most use out of the exercises described in levels two and three. Feel like you could do an endless number of push-ups? 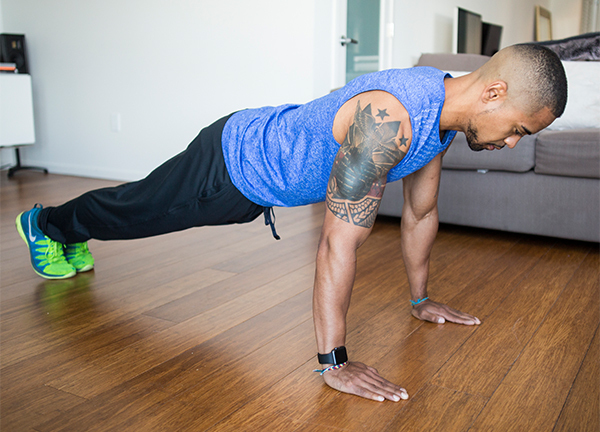 Check out level four for some push-up variations that are sure to challenge you. You don’t need to do push-ups every day to get results — start by performing any of these variations a few times a week on nonconsecutive days to help you get better at push-ups. Good luck! If you can’t do any push-ups, try incline push-ups and push-up static holds. If you can’t do a single strict-form push-up, try the move with your hands elevated at least 12 inches on a sturdy bench, box, or table. 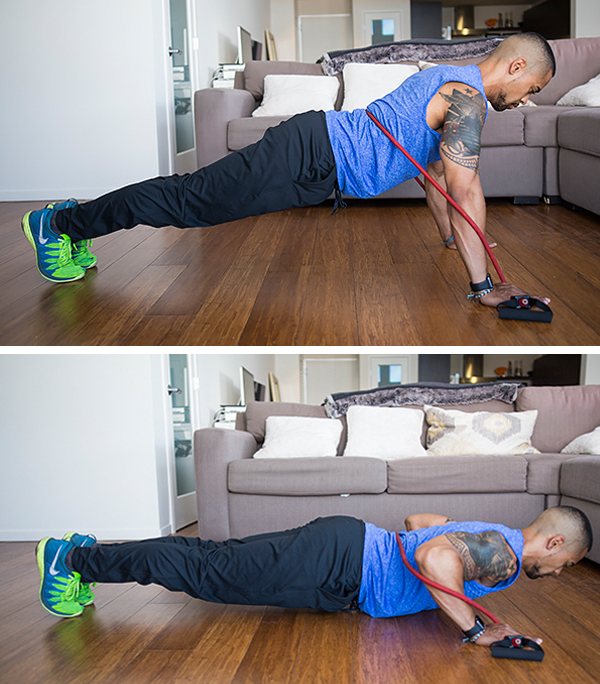 These are known as incline push-ups, and they’re a great type of push-up for beginners. The higher the surface, the easier the move. You can even do them with your hands braced against a wall. Perform three sets, resting a minute between sets. When you can do three sets of 10 reps at a given height, lower your hands and repeat the process. Next, practice the straight-arm plank: After your workout, hold the top position of the push-up with perfect form as long as you can. Work up to holding it for 30 seconds to 1 minute. Once you can do three or more push-ups with your hands on the floor level and you can hold a straight-arm plank for at least 30 seconds, it’s time to move on to the next level. If you can do three to six push-ups, try low-rep sets and negative reps.
You’re getting stronger! Here’s what you should do to keep improving. On workout days, drop and bang out a few push-ups, stopping a couple of reps shy of your max (which might mean just doing one push-up each “set”). Do this up to a dozen times, either in straight-set fashion (resting 30–60 seconds between sets) throughout your workout or during the day at random intervals. On those same days, practice negative reps: Take 10 to 20 seconds to lower yourself from the top position of the movement to the floor, using perfect form. Drop all the way down to the floor, come back up to the plank position, and repeat, for a total of three slow reps. If you can do seven to 10 push-ups, try low-to-mid reps. Your push-up skills are getting impressive! What’s likely holding you back from higher numbers now is the “sticking point” at the bottom of the movement. To fix it, do three sets of regular push-ups, stopping a rep or two shy of failure. Then do a set of low-to-mid reps, where you go repeatedly from the lowest position (chest a few inches from the floor) to the midpoint (chest halfway between the floor and the top of the position), again stopping a few reps shy of failure. If you can do 15 or more push-ups, try decline push-ups, banded push-ups, spiderman push-ups, and plyo push-ups. You’re a pro! But that doesn’t mean you should abandon this great move. Now it means that you should try to master different types of push-ups instead of just strict-form. Continue to improve and challenge yourself with these four push-up variations. 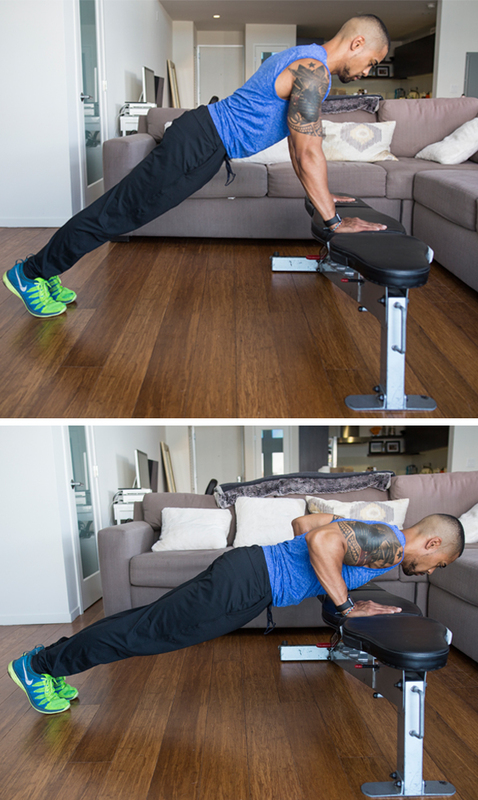 Feet-elevated push-up: Perform a push-up with your feet raised on a box, bench, or short table). The higher the surface, the more difficult the move. These are called decline push-ups. Banded push-up: Perform a push-up holding the ends of an exercise band, with the elastic looped across your back for added resistance. Spiderman push-up: Starting in a plank position, swing your right leg out sideways to bring your right knee to your right elbow as you bend your arms down so your chest is within a few inches of the floor. Push back up as you return to the starting plank position and repeat with your left leg. Continue alternating. Plyo push-up: Keeping your elbows tucked, lower your torso until your chest is within a few inches of the floor. Then, push up with enough force for your hands to leave the ground while keeping your body straight. Land softly, and transition immediately into your next rep.